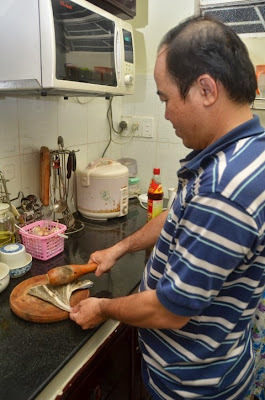 My cousin Khiêm works as a seafood inspector. Sometimes his job takes him far out in the ocean. I remember many years ago when I first returned to Vietnam for a visit, he caught an ocean snake on one of his trips. He made snake hot pot to share with a group of his friends and gave me a bowl to try. That was my first encounter with eating snake and I remember it was very tasty! 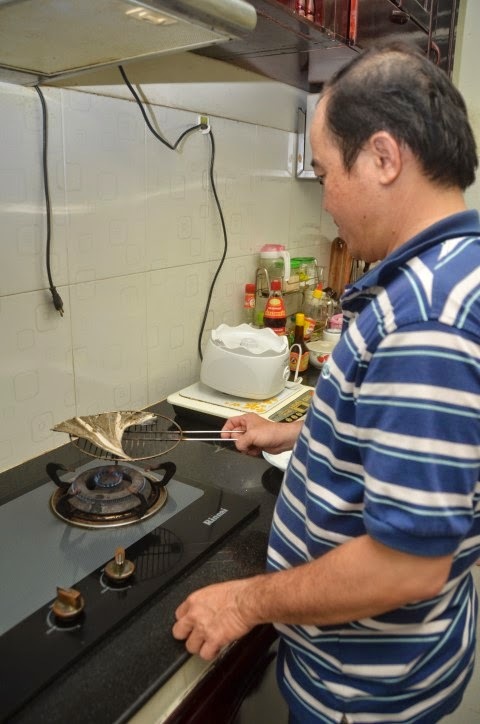 That was also when I realized Khiêm had some kitchen skills! While visiting him and his family this week, he said one of his friends caught sting rays while out in the ocean. Recently he was given some dried sting ray known as cá đuối in Vietnamese. He said his friend caught the ray, sun-dried the filleted pieces under the tropical sun on his own boat. Khiêm thinks it took only about 4-5 days to dry since the sun can be quite intense out in the ocean. I think a combination of hot sun and the sea breeze may contribute to a quicker drying time. Once completely dried the fish is bagged and stored in a dry place. 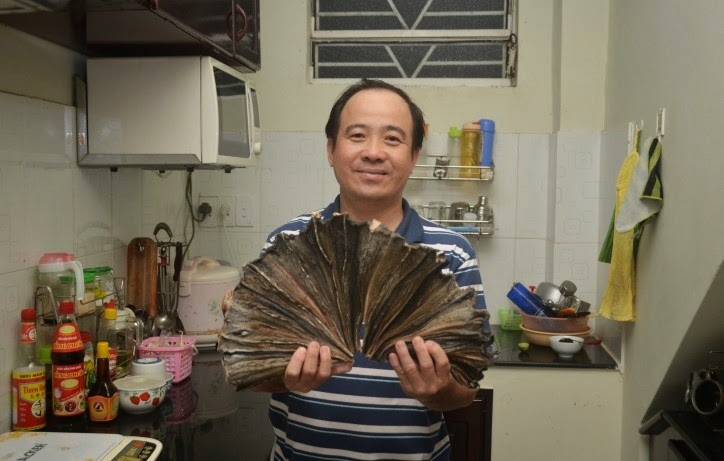 There are many ways to eat this dried fish according to Khiêm. One popular way is to grill it, beat it a little and then tear a small piece and dip it in a tamarind sauce. The fish is chewy and a little salty. The sauce provides a nice balance of sweetness and tartness. Overall it was quite delicious! 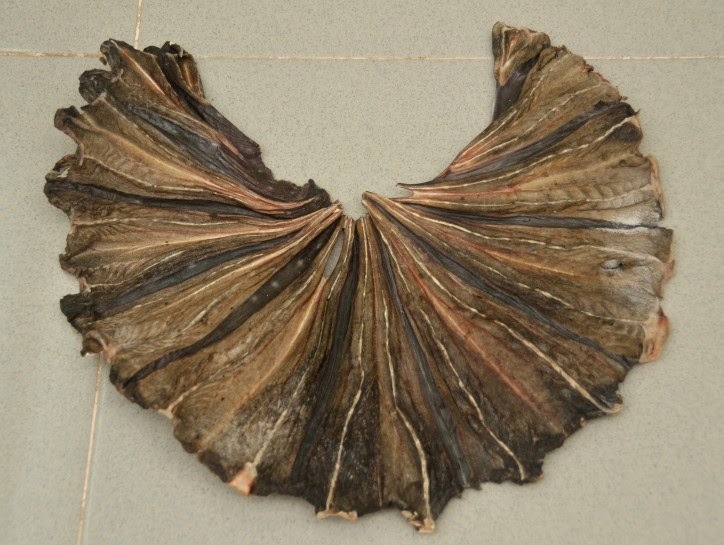 Thank you Khiêm and friend for sharing this rare piece of fish with me! 1) May use a tong or a small grill grate to grill the ray piece over about 6 inches using very low heat for about 3 minutes on each side. Avoid burning the ray. 2) Beat the ray piece with a mallet, hammer or pestle for about 30 seconds to a minute. 3) Enjoy by removing a small piece and dip it in a tamarind sauce. 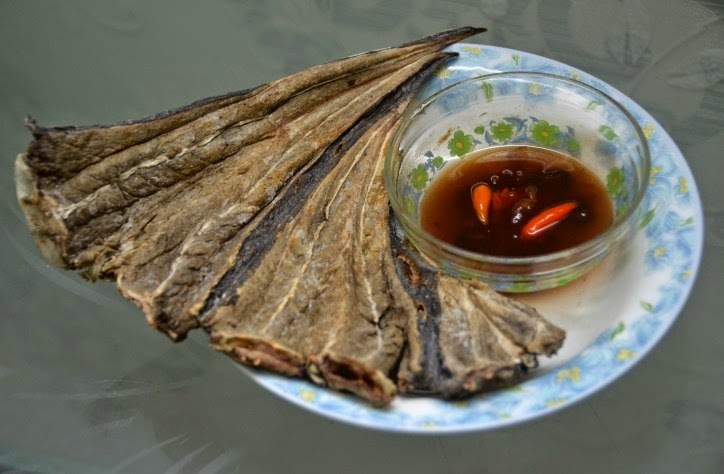 *This grilled dried sting ray is great for beer food!! You can serve this with Saigon Beer or 333. 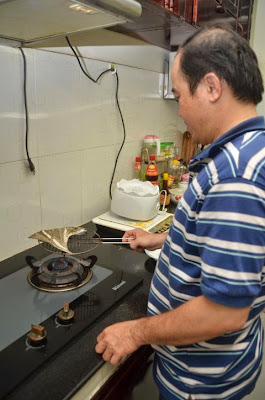 *If you do not have dried sting ray (ca duoi kho) you can make it using dried squid. 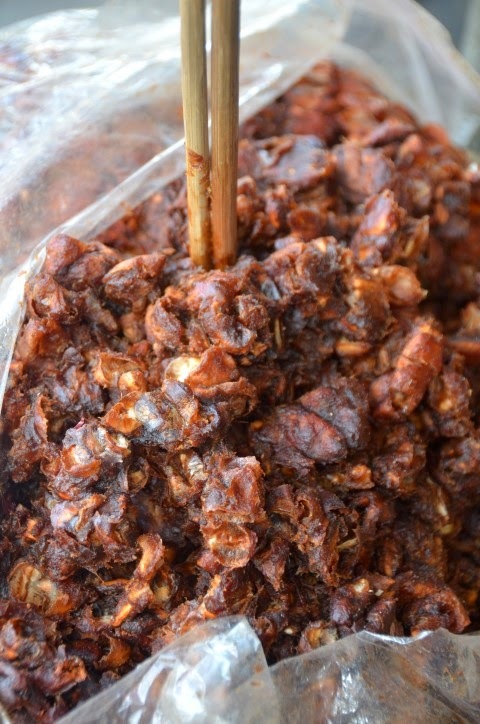 The dried squid is readily available in Asian markets across the United States. 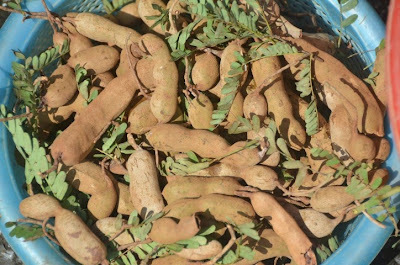 Mix tamarind, water, and sugar to dissolve the sugar and render out the tamarind juice. *There is really no recipe for this. 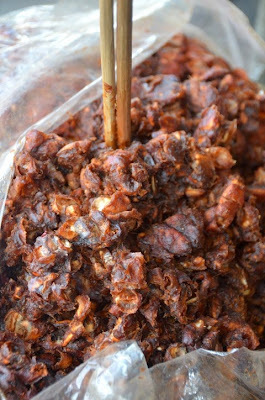 It's a matter of using the back of a spoon to mash tamarind seeds and pulp with warm to hot water to render tamarind juice. Then either strain the seeds and pulp out or leave in and add sugar according to your taste. If you prefer this sauce to be spicy then either mash or chop some hot chili peppers to add. My cousin, Ngoc made this sauce and added the seeds and pulp. She left the chili peppers whole for a nice presentation.